Tao and Taoism (Daoism) Beliefs, Definition, Quotes - What Is Taoism? Taoism binds together opposite and complementary forces, yin and yang, which are interdependent in nature. Yin is believed to represent femininity and water, while yang is the masculine energy and light. When these dualities are well-balanced in life; the belief is a result in an uninfluenced pure self. Taoism is a Chinese philosophy centered around the concept of Tao. It stresses the unification of contraries. Taoism also seeks harmony with nature. The primary text of Taoism is Lao Tzu's Tao Te Ching, which works to express the essence of Tao. The book stresses the ineffability of the Tao, and is the second most translated book after Christianity's Holy Bible. It is also one of the oldest books known in the world. The Tao Te Ching is composed of 81 poems, each of which focuses on either an aspect of Tao or an aspect of being an effective leader. Taoist ethics are concerned less with doing good acts than becoming a good person who lives in harmony with all things and people. Because of this, devoted Taoists tend to be nice and accommodating people. Nonetheless, it is important to distinguish between Taoism as a philosophy(as described above) and Taosim as a religion. Taoist religious practices include numerous occult rituals including 'internal alchemy'-the ingestion of minerals and herbs to supposedly restore balance to one's Yin and Yang energies-and the invocation of various pagan deities. The ideal of the Taoist Sage is one who removes themselves completely from society to live "in close harmony with the natural rhythm and flow of life." Taoism originated in China. Accurate figures for the number of believers of Taoism are elusive, for two reasons. Firstly, Taoism is a loosely defined faith, so some people don't even realize they're practicing it. Secondly, the Communist Chinese government does not record most religions in its censuses, on account of the government's anti-religious stance. However, Taoism is one of the five religions officially recognized by the Chinese government, the others being Protestant "Christianity", Catholicism (see also Vatican II "Catholicism"), Buddhism, and Islam. Taoism (also spelled Daoism) is an ancient religion and philosophy that began in China some 2,500 years ago. It's adherents are mostly found in Far Eastern countries such as China, Malaysia, Korea, Japan, Vietnam and Singapore where its temples are found. Current estimates are that several hundred million people practice some form of Taoism, with some 20 to 30 million on the Chinese mainland. This is quite remarkable since mainland China is a communist nation and forbids many forms of religion. Like many religions, Taoism has its own set of scriptures, the main one simply referred to as the "Tao." Other texts are included, and the full spectrum of Taoist canon is known as the Daozang. The word "Tao" comes from the character in the Chinese alphabet of the same name. The word means "way" or "path." Taoism has never been a unified religion, and some scholars place it in three categories: philosophical, religionist and Chinese folk religion. Because of this it is difficult to pinpoint exactly what Taoists believe. Roughly stated, Tao deals with the flow of the universe, or the force behind natural order that keeps all things balanced and in order. It is considered to be a source of existence and "non-existence." Some Eastern religions refer to this as the "yin and yang" of the universe, which can also express itself as the equal forces of "good" and "evil." Most adherents of Taoism believe anything from polytheism (belief in many gods) to ancestor worship. Taoists tend to worship mostly on holidays in their calendar when food is set out as a sacrifice to the gods or the spirits of departed ancestors. Other forms of sacrifice include burning paper money so it will rematerialize in the spirit world for a departed ancestor to use. A number of martial arts disciplines such as T'ai Chi Ch'uan and Bagua Zang have their roots in Taoism. Few people in the Western world practice Taoism, and it would appear some have confused Tao with Zen, as evidenced from the books The Tao of Physics by Fritjof Capra or The Tao of Pooh by Benjamin Hoff. Taoism has the same world-view as Confucianism or ancient Chinese folk religion. Its philosophy operates within the same paradigms. It celebrates man's association and interdependency with nature. Moving on to a wider plane, the relationship between religion and the universe takes the form of veneration, which lies beyond the confines of time and space, ancestor worship and belief in the sovereign. The principles on which Taoism thrives even today include Ch'i, Feng Shui, interdependency between life and death, the Eight Immortals and the Ultimate Reality. Ch'i: Ch'i is also pronounced and spelled as Qi. This fundamental concept means 'breath'. However, Ch'i also refers to the flow of energy or life force. The philosophy highlights the fact that there is a life force that fills space and pervades everything around us. Ch'i is believed to be the womb of matter. A balance of its quality and quantity is considered very essential for health and wellness. It is considered as the animator of life. Ch'i, according to ancient Chinese belief, can be regulated through breath control and acupuncture. Feng Shui: Feng Shui is the Chinese art of placement. It involves the stabilization of the flow of ch'i, yin and yang and the five elements in any environment. This is believed to have an impact on the health and wealth of occupants by redirection and acceleration. Interdependency between Life and Death: Life and death are considered as two aspects of the same universal reality. This reality is also referred to as Tao. Taoism understands death simply as a phase of transformation, ideally understood as the shift from yang to yin. This automatically eliminates any fear or desire for death. Taoism believes that everything has an opposite. Duality is relative in nature and forces are highly interdependent. Hence, Taoism does not struggle or oppose any of the dualities. A perfect understanding of this duality is believed to generate immortality and superhuman ability. The exercises involved in achieving a better understanding of the forces of duality include maintaining a balanced diet, regulating breath, controlling sexuality and identifying with the subsequent moral harmony. A moral and upright life is indeed important for achieving immorality and eternal life; however, without the Faith it is impossible to please God or attain to this end (Hebrews 11:6; John 3:16). The Eight Immortals: Taoism identifies eight ageless and very powerful beings. These powerful beings are believed to have been born in the Tang dynasty. A mention of these Eight Immortals is made in Chinese art and literature. Each one has its own symbol and special power and together, they are associated with good fortune. The interpretations are—age, youth, wealth, poverty, position, rank, feminine, masculine and the commoner. The Ultimate Reality: In Taoism, Tao is defined as a natural order that is not easily revealed. It not only encompasses all, but also has no characteristics. Hence, the ultimate reality is best understood as 'being' and 'non-being'. Although the word Tao means "way," it is not the true Way. There are many religions which claim they are one of the ways to get to God. But Jesus Christ said that He is the only way to God (John 14:6). Because Taoism denies this, it fails in that it does nothing to deal with the sin nature of mankind. Everyone who has ever been born (except Jesus and Mary) came into the world with original sin nature inherited from Adam in the Garden of Eden, and it is that sin, in addition to our own sins that we comity during life, that separates us from God. A holy and righteous God cannot accept anything sinful in His sight. But in His mercy, He sent His Son Jesus (who was God in the flesh) into this world to die on the cross and exchange His righteousness for our sin through baptism (2 Corinthians 5:2; Acts 2:38). It is only by accepting this atoning death, receiving baptism and believing in Christ that we can escape the judgment of God and receive eternal life (Ephesians 2:8-9). Christ, not Tao, is the way to eternal life. The concept of yin yang (often called "the yin and the yang") is a Chinese philosophical idea used to explain how opposite forces are interconnected and interdependent upon each other. In other words, black could not exist without white, dark without light, cold without heat, etc. The yin yang concept is the basis of many branches of classical Chinese science and philosophy, traditional Chinese medicine, and different forms of Chinese martial arts and exercise, including tai chi. As with much of Chinese philosophy and culture, the concept of yin yang is mysterious and complex and a full treatment of it is not possible here (see yin yang). 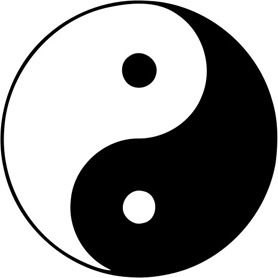 The connection between yin yang and Taoism, however, is undeniable. While Taoism is directly contradictory to biblical Christianity, dichotomies (divisions into two, especially mutually exclusive or contradictory groups or entities) abound in the Bible. Jesus Christ is at one time fully God and fully man, also known as the hypostatic union. Death is necessary for life (John 12:24). Christians are new creations in Christ, but live in the flesh (2 Corinthians 5:17; Romans 7:18-25). We are at one time both God's children and His slaves (John 1:12; Ephesians 6:6). We have died, but now we live (Galatians 2:20). In the sense that opposites exist in relation to one another, yin yang does relate to truth. In its relation to Taoism and other false belief systems, however, yin yang is definitely not biblical.